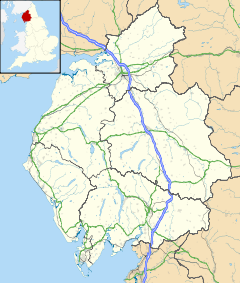 Milnthorpe is a large village and electoral ward within the South Lakeland district of Cumbria, England. Historically part of Westmorland and straddling the A6 road, the town contains several old hostelries and hosts a market in The Square every Friday. The parish and ward of Milnthorpe had a population of 2,106 recorded in the 2001 census, increasing to 2,199 at the 2011 Census. Milnthorpe is the site of the 19th-century Church of St Thomas, which overlooks The Green and The Square. Prior to its construction Milnthorpe was in the parish of Heversham. Milnthorpe became a centre of business and activity because it was originally a port, using the River Bela and estuary (now only navigable to Arnside), and it remains a significant commercial centre for the area. Local industry includes Duralon Combs, a 300-year-old comb-making family business. Also Big Fish Internet Ltd, Britain's very first website design agency, founded in early 1996. Tourism and hospitality have always thrived, Milnthorpe being a convenient stop-off point on the A6 for coaches and cars en route to the Lake District. Just to the north is Levens Hall, famed for its topiary. The village used to be a major traffic bottleneck before the opening of the M6 motorway in 1970, and the A590/A591 Kendal link road a few years later. The popular children's drink Um Bongo was made in Milnthorpe by Libby's in the 1980s. Each August, the Friends of the Exhibition holds its annual art exhibition in the church. Milnthorpe has two steel bands, one for adults and the other based in the town's junior school. The grade I listed house Dallam Tower, with an estate known for its deer, stands near to the River Bela just south-west of Milnthorpe, whilst St Anthony's Tower may be seen on the top of St Anthony's Hill to the north-east of the town centre, overlooking the village and the housing estate of Owlet Ash Fields in nearby Ackenthwaite. It has one secondary school, called Dallam School, and one primary school, called Milnthorpe Primary School. The three pubs in the village are The Cross Key, The Bull's Head and The Coach and Horses. John Taylor, third president of The Church of Jesus Christ of Latter-day Saints from 1880-87, was born in Milnthorpe and lived there until he emigrated to Canada. The former Leader of the Liberal Democrats (2015-17), Tim Farron (MP for Westmorland and Lonsdale) lives in Milnthorpe. ^ "Parish headcount" (PDF). Cumbria County Council. Retrieved 2009-01-13. ^ "Parish population 2011". Retrieved 11 June 2015. ^ "About Tim Farron". Tim Farron MP. Retrieved 24 September 2015. Wikimedia Commons has media related to Milnthorpe.